This tutorial shows you how to use a Piezo element to detect vibration, in this case, a knock on a door, table, or other solid surface. A piezo is an electronic device that generates a voltage when it's physically deformed by a vibration, sound wave, or mechanical strain. Similarly, when you put a voltage across a piezo, it vibrates and creates a tone. Piezos can be used both to play tones and to detect tones. The sketch reads the piezo output using the analogRead() command, encoding the voltage range from 0 to 5 volts to a numerical range from 0 to 1023 in a process referred to as analog-to-digital conversion, or ADC. If the sensors output is stronger than a certain threshold, your board will send the string "Knock!" to the computer over the serial port. Open the serial monitor to see this text. Piezos are polarized, meaning that voltage passes through them (or out of them) in a specific direction. Connect the black wire (the lower voltage) to ground and the red wire (the higher voltage) to analog pin 0. Additionally, connect a 1-megohm resistor in parallel to the Piezo element to limit the voltage and current produced by the piezo and to protect the analog input. It is possible to acquire piezo elements without a plastic housing. These will look like a metallic disc, and are easier to use as input sensors. PIezo sensors work best when firmly pressed against, taped, or glued their sensing surface. In the code below, the incoming piezo data is compared to a threshold value set by the user. Try raising or lowering this value to increase your sensor's overall sensitivity. This sketch reads a piezo element to detect a knocking sound. It reads an analog pin and compares the result to a set threshold. port, and toggles the LED on pin 13. 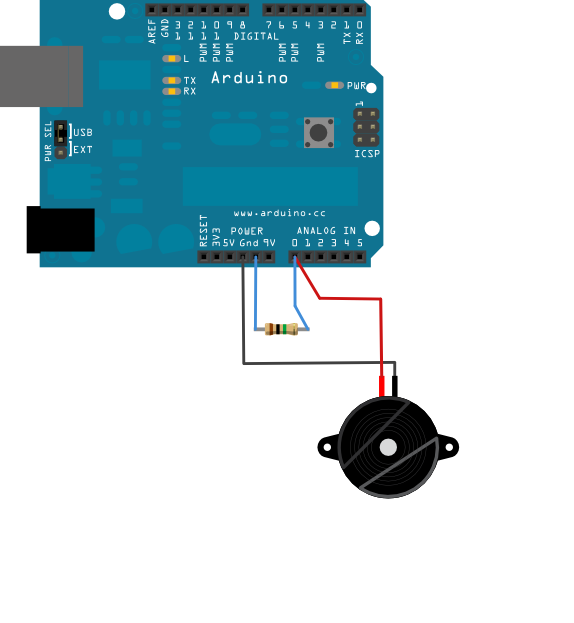 AnalogInput - use a potentiometer to control the blinking of an LED. AnalogInOutSerial - read an analog input, map its values, and then use that information to dim or brighten an LED. 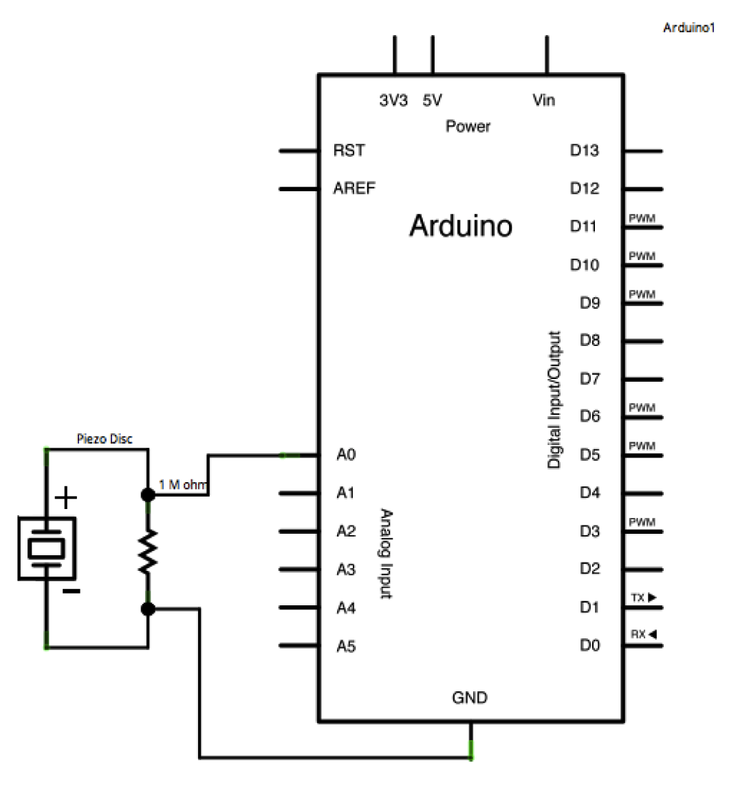 ADXL3xx - Read an ADXL3xx accelerometer. Ping - Detect objects with an ultrasonic range finder.